The Ogola Okuombe family wishes to announce the passing on of their matriarch Margaret Akong’o Ogola which occurred on 19th May 2018 at Akidiva Hospital, Migori. She was widow to Pitalis Ogola Okuombe of Konduru Village, Kajulu I sub-location, Kanyamkago West location, Uriri constituency in Migori County. She was sister to Mogesi, Mageni and Akuku, and step-sister to Obade, Jannes, Isaiah, Jabuya, Handrew, Charles, and Sikuku. She was mother to Charles; Cyprian and Felix (both of Britam, Eldoret); Okeke (Advocate, Nakuru), Pastor Osoo (Chunge Ayego PEFA Church) and Ezekiel (Mega Pack Kenya Ltd, Nakuru). 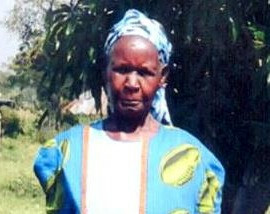 She was mother-in-law to Dinah; Olga; Caroline; Elvera (AP Camp Kiandutu, Thika); Pamela and Lucy. She was co-wife to Siprina and the late Mary. She was a sister-in-law, step-mother, aunt, grandmother, and great-grandmother to many. The cortege leaves the Migori County Referral Hospital Mortuary on 8th June 2018 at 1.00 p.m. for a church service at Konduru PEFA church. Burial will take place on 9th June 2018 at her home in Konduru village next to Konduru Primary School/PEFA church. May the Lord rest her soul in eternal peace.